she's good for the planet... Renault ZOE is THE car that we've all been waiting for since the revelation of the ZOE Preview show car, which already boasted 90% of the mass-production model lines. 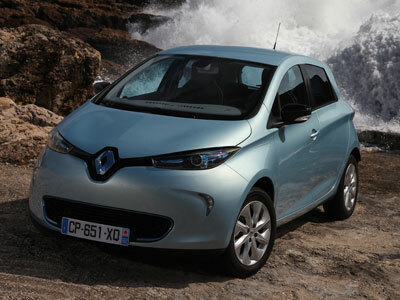 Renault ZOE not only looks good on paper, after our test drive we're totally under its electric spell! We could go on forever about Renault's new supermini. But let's start with its look. The interior is uncluttered, with a propeller blade-shaped trim on the dashboard, fluid lines, materials that are soft to the touch and soothing colors (like this white interior in the LIFE and ZEN versions) that are not usually found in a Renault. No efforts have been spared to make the atmosphere on board ZOE both calm and resolutely ecological, even before switching on the relaxing and purifying air ionizer or the fragrance dispenser. ZOE is a real little “spa car”! The R-Link multimedia tablet, which we already saw in Clio, sits proudly in the middle of the dashboard, but now features applications dedicated to electric vehicles and blue back-lit surrounds on the heating control buttons, replacing the chrome used in Clio. But we will come back to R-Link and its functions later on, because we have much more to say about ZOE! In terms of comfort, ZOE feels just the same as an internal combustion vehicle. The cabin is roomy, the front seats, which are unique to ZOE (made in Flins! ), are unusually shaped, but identify the ZOE family at first sight. The upholstery is decorated with the famous "Z.E." logo and pattern, and is treated with Teflon, which is strong and easy to maintain. The blue chrome finishing touches, which are specific to Renault's Z.E. range, can be found in several places in the cab (dashboard, steering wheel and gear lever) and on the exterior of the car (logo, ZOE badge, headlights). The boot is spacious and even bigger than in New Clio, measuring 338 liters, mainly because ZOE's battery is positioned under the floor of the car, rather than behind the rear seats where it would take up some of the boot space, like on other electric cars. The TFT screen displaying the speed on the dashboard changes color depending on the speed of the vehicle, which is a very nice touch. If you drive too fast, the screen turns purple to show that ZOE is not happy because you're consuming too much energy. If you drive ecologically, the screen stays green and is blue when your driving style is neutral. As on Clio, the rear door handles are concealed in the door uprights. They are even marked with a fingerprint of ZOE's designer, Jean Semeriva. The trick makes ZOE look more compact, with the exterior appearance of a 3-door model. We also discovered ZOE's new colors, which we had never seen before. ZOE is not available in only the good old White, Black and Energy Blue colors! We especially liked the opaque Azure Blue, which creates quite an effect. But there's more to ZOE than just a pretty face. While ZOE behaves like a real tourer on the open road, it prefers the city, where the regenerative braking system comes into play. With an 88 hp / 65 kW motor that outputs 220 Nm instantly, it leaves all the other sedans and sports cars way behind when the lights turn green, without emitting any polluting gases when the driver pushes the pedal to the floor. ZOE a pleasure to drive, because it is so quiet and punchy, it is also a genuine concentrate of innovations. More than 60 patents were filed in ZOE's design phase. The most significant is the Range OptimiZEr, which enables ZOE to offer the longest range of any volume-production electric vehicle (210 km in the NEDC cycle and 150 km in standardized urban and peri-urban driving). ZOE is also fitted with a regenerative braking system that recovers almost all of the energy that is lost when the brakes are applied. When the system is working, the little battery on the dashboard lights up brightly to show that the battery is being recharged. And the system also comes into play when the accelerator is released. The motor recovers the vehicle's kinetic energy and converts it into electric current that recharges the battery. In our test drive, we drove 40 km on enough power to cover a range of 32 km in ECO mode. ZOE is also fitted with Michelin Energy E-V tires with low rolling resistance and a heat pump that consumes between two and three times less than a conventional system, which means that you can use the air conditioning and heating as often as you like. So let's talk about the ECO mode. We were advised to use this function, which is switched on using a button next to the gear lever, when driving in towns. In this mode, the speed is limited to 95 km/h and the air conditioning and heating systems are restricted in order to optimize ZOE's range, if necessary. There is no need to press the button again to switch off the ECO mode. Simply accelerate sharply, a feature that is very useful when, for example, you want to overtake another car. So what about R-Link? Every version of ZOE is equipped with this tablet with a touch-sensitive screen. R-Link features all the usual functionality of a conventional Carminat TomTom®: radio, navigation, telephone, music and connections with MP3 players by Bluetooth® or USB cables. In addition to the usual functions, a selection of applications specific to electric vehicles is also available. The TomTom® Z.E. LIVE navigation function permanently displays a circle representing the range of the vehicle. It is also possible to view a list of the nearest charging stations. R-Link's Z.E. functions gave us advice on how to drive economically, plus an analysis of our driving style, with the “Driving eco2″ application, which analyses the distance covered and energy consumption. In ECO mode, we achieved an encouraging 92/100 (OK on speed, not so good in terms of anticipation) by applying a few eco-driving principles. In this mode, the range can be increased by up to 10%. Other applications that we tested include R-Tweet, which can be used to tweet when parked (some of the applications are disabled when in motion for safety reasons), and Elle Astro, which reads today's horoscope! We did not test the “Text to Speech” function, which we will look at in a more comprehensive test of R-Link. How is ZOE recharged? Mainly on a Wall-Box (minimum 3 kW), between 6 to 9 hours. The charging cable that comes with ZOE (in a bag in the boot), can be plugged on the said Wall-Box, or public charging stations (standard and accelerated charge). The recharging socket on the car is concealed under ZOE front logo. Public quick-charge stations (43 kW) have their own built-in cable that can be connected to the car and charge its battery to 80% of its capacity in 30 minutes. If you're scared you won't be able to recharge anywhere around you, relax! Renault has partnerships all over Europe. In France for instance, ZOE can be charged at Autolib' stations, in supermarkets, and at Renault dealerships. You can find a list on your R-Link while driving ZOE. We had the chance to experience an accelerated charge during our lunch time, where ZOE, at 22 kW, recovered 80% of battery autonomy in 1 hour. Very convenient when you've got miles to cover. We came to a very positive conclusion after our test drive. Renault ZOE is a car with a strong personality and its own specific functionality, a point well worth mentioning. It is attractive, easy to recognize at a glance and ecologically friendly, because it does not emit any polluting gases at all. We know that ZOE is still not suited to all types of usage, but it offers a good comprise as a first car (and not as a second car, which you may have read elsewhere), for your everyday commute to work, with a second family car at home for holidays and other long trips. With a low price tag, thanks to government subsidies, it's definitely the first mass-production electric car that is affordable. And all we can recommend is for you to test drive it and see for yourself! You'll love it too!